In celebration of G-Day, we are releasing episodes 1 and 2 today! In this episode we discuss how these two films only within the context of how they influenced the creation of Godzilla. Both of these films significantly affected popular culture and the kaiju genre. 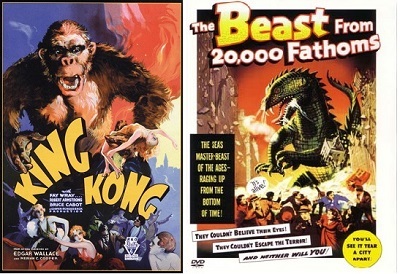 Our thesis is: King Kong + The Beast from 20,000 Fathoms +Japanese Culture + Castle Bravo Nuclear Test = Godzilla. This entry was posted in Podcast and tagged 4k, 4k video, Brian Scherschel, Cedar Creek, film history, films, giant monsters, Godzilla, Gojira, Japan, kaiju, Kaijuvision, Kaijuvision Radio, King Kong, Kong Kong (1933), movies, Nathan Marchand, Origins of Godzilla, Ray Harryhausen, The Beast from 20000 Fathoms, woods by Kaijuvision Radio. Bookmark the permalink.